I've finished my first batch of procion mx dye experiments and here are the results. The instructions that came with my dye kit were for one pound of fiber or fabric. Since I wanted to work with smaller amounts, I decided to use a recipe from Curious Weaver. Kaz has a page of tutorials and articles here. If you scroll down toward the bottom, you'll see Dyeing for Weavers - A beginners guide to fibre reactives for cellulose fibres. This is a downloadable pdf document with step by step instructions, including charts for different amounts of fibers and depths of color. The table salt levels the color and also helps the solubility and take-up of the dye. Washing soda serves as the dye activator. For the dye powders, I chose the primary colors to start. These are Lemon Yellow MX-8G, Clear Blue MX-R, & Warm Red MX GBA. "Anonymous" commented in a previous post about the safety of procion mx dyes. A pdf MSDS (material safety data sheet) for Procion MX dyes is available from Fibrecrafts and can be downloaded by clicking here. To see their complete list of downloadable MSDS for a variety of dyes and accessory chemicals, click here. The instructions called for about an hour soaking time, with frequent stirring. The actual time I left them in the dyebath was about two hours. After removing the cotton from the dyepots, a cold water rinse followed to rinse out all the salt. After that I washed each one in hot soapy water, rinsed, squeezed out excess water, and let dry on a towel. The cotton was pretty clumpy when dry. These have been teased out for a photo. I'm pretty happy with the results, though the red is lighter than I might have liked. My daughter calls it Watermelon Red. What's next? Experimenting with some color mixing. Summary of Procion MX Dye Experiments - All of my color mixing experiments so far. Was there much dye left in the pots when you took these out? I am curious if leaving the cotton in the pot longer would have gotten a darker color, or if there is just a saturation point for the cotton. Patrick, that's an excellent question. Actually there was a lot of dye leftover in the pot. From what I'm learning about this type of dye, the dye molecules begin to bond as soon as an activator (in this case the washing soda) is present. The molecules that don't bond to the fiber, bond to water molecules. Because of this, the dye stock can evidentially never be exhausted. Out of curiosity, I plan to do a little experimenting with this, and will share my results in an upcoming post. hi Leigh, that doesn't look bad for a small outdoor "studio":)) although the red could be stronger - you can always blend it with other short fibres or mix it with some yellow or blue when you card it (won't make the red redder though:)). if all else fails you might be able to overdye it with something? the colours look very summery and fresh to me! Thank you Bettina! I've thought about that red, and finally decided that since this is a learning project, then I'll just experiment with a darker red later. I think it's not so much that I don't like the watermelon red, as it wasn't what I was expecting, especially considering how red the dye bath was! Too, I didn't start with a pure white, so I know that effected the results as well. I love the colors! I'm going to have to try this. First, the hardest thing for me to overcome was the "disappointment" in the lighter color of the dry dyed fiber. It always looks much richer wet in the pot. Leaving it in longer would not help. There is always going to be lots of dye (useless at that point) in the pot. More dye powder might have helped. A different color dye powder might have helped. It's possible also that the cotton needed more scouring. Second, I like your round photos. Very nice with the fibers. Thank you Jewel and Peg. I think I will try the red one more time with more dye powder. And at some point I will try a different shade of red. I knew that the dry fiber would be lighter than the wet, but had no idea of what to expect. At least now I have a reference point for this particular red! Nice work and good information, Leigh. Thank you. I notice that your salt is iodized salt. When I've used FR dyes, I use kosher salt which does not have iodine in it. I don't recall where I read to do that, but am wondering if you've encountered similar information. Lovely colors!! I like the red but especially like the clear yellow. I've concentrated on dyeing animal fibers but after your post will have to give cotton a try. Valerie, I looked for information on using iodized salt but couldn't find anything. It makes sense to use the non-iodized, but I just used what I had. Well, I definitely did not use sea salt! I figured the minerals would definitely interfere. Barb, I plan eventually to try some different fibers too. It's just that I've got sooooo much cotton! Very good info here Leigh, I appreciate your attention to the details! ....once, when I was an enthusiastic newbie...I used the dyes on angora and sheeps wool. Of course I was much to impatient to read the instructions, and liked the idea of salt as a mordant...so I just went for it. The sheeps wool was ruined, but the angora (bunny) was fine. I wondered if this was due to the medulla being hollow. Thanks for the tutorial! Always good to have new dyeing strategies in the mental file cabinet. I accidentally used a procion dye on some tussah silk a number of years ago. The color was a bit muted, but very well set. I don't think I'd use it again for that fiber, but I was sort of pleased with how it all worked out. wow, those are beautiful! What a fun experiment! T.
How did you tease your cotton out like that? I have 10 pounds of pima lint and when I dye it, I have a hard time teasing it afterward. Do you not stir your dyepot? I would love any advice you have to share!! Jenadina, I confess that I teased it all by hand! Yes, it was very clumpy after dyeing, and I did stir it in the dye pot, a lot. I'm finding that with minimal hand teasing and my cotton carders, I can get a fairly smooth preparation, but not perfect. The resulting yarn is still pretty slubby. Actually, I have no idea what kind of cotton it is. 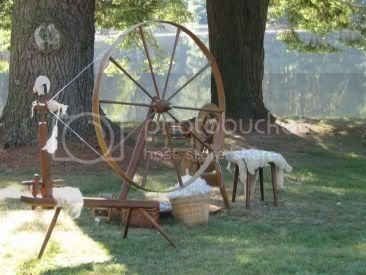 I was given a 10 pound box of it for doing a day of historical spinning demonstrations quite a few years ago. Evidently it came from one of the local (North Carolina) mills. Dyeing really does make a mess of the lint. I think dyeing the batts is a much better idea, especially if a more even yarn is wanted. 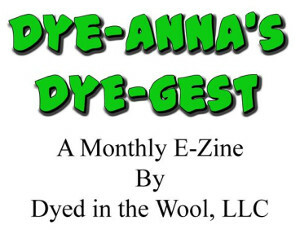 I chose to do the lint because I participated in an online vegetable fiber dyeing challenge. That cotton was the only vegetable fiber I already had on hand.